We love growing fruit and vegetables indoors and it’s surprising just how much can be grown inside. When we had a garden we grew all sorts from Potatoes, Strawberries, Purple Broccoli, Purple Carrots and more. Losing that was quite sad as we all really enjoyed harvesting our hard work. We decided that regardless of being in a flat, we would continue to grow what we could indoors with the girls. Providing you have a windowsill that gets plenty of sunlight, a compost bag and deep pots you can grow fruit and vegetables indoors easily. If you are looking at growing fruit and vegetables indoors then we have a handy list you can use! Izzy went through a phase of loving Peppers, so we decided to grow peppers on their windowsill. When we shared our post and success on twitter I was pleased to find our harvest turned out better than some outdoor plants! Peppers grow really well on a windowsill facing the sun, the girl‘s windowsill really heats up during the day providing a fantastic greenhouse effect. A strawberry plant will happily grow on a windowsill with plenty of sunshine. We tried growing Strawberries in a can but unfortunately, Izzy knocked it over several times. It is something we will try again, possibly this year though as I have seen some great indoor harvests. Anyone who follows me on Instagram will no doubt have spotted Izzy repotting some cucumber plants for her windowsill. She dropped a few off to Martyn too as he also loves growing fruit and vegetables in his garden. Izzy has been repotting cucumbers to grow on the windowsill this evening, with a few extra for @mr_kitney too! There are several varieties that grow really well indoors such as Romain, Iceberg and Leaf lettuce. You don’t need a large pot either as Lettuce doesn’t tend to have a large root system. Again, a good windowsill with sunlight is the perfect place to grow Lettuce. Similarly to Lettuce, Spinach is windowsill friendly, takes up little space and takes little maintenance. I love spinach and want to give this a go so we can attempt making our own spinach and ricotta cannelloni. Dwarf fruit trees such as Lemons, Limes, Figs, Peaches & Apricots can be grown indoors. Admittedly these take up a little more space and need a room with enough sunlight coming in. These can produce really well indoors surprisingly! Unfortunately we don’t have the space otherwise I’d have a Lemon tree growing, I love Lemons but rarely think to buy them. Tomatoes grow quite well on a windowsill too. We grew a tomato plant a few years ago but we don’t eat them. The girls did try them though and we gave them to a friend who really enjoyed them. Carrots will need a slightly deeper pot to grow in, however, they do grow quite well indoors. We’ve grown these both indoors and outdoors and the taste difference to shop bought is amazing. Mushrooms like dark places so growing them indoors is ideal! You can buy some fantastic kits which I’m planning to do myself at some point. I’m the only one that likes mushrooms though. There are plenty of other fruits and vegetables that grow well indoors and we intend to discover a few more while we are in a flat. 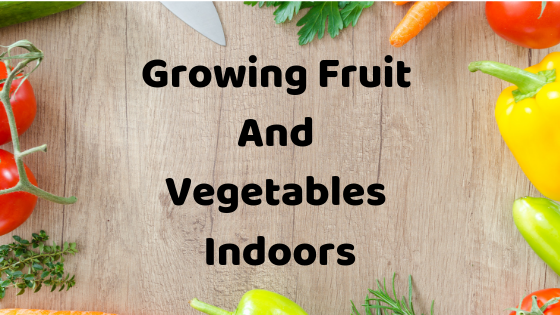 Have you grown fruit and vegetables indoors before? We've successfully grown chillies indoors, as well as lots of herbs such as basil and parsley. I will have to try growing peppers indoors as it is never warm enough to grow them outside. We had a vegetable garden in our old house and had lots of success with courgettes and rhubarb, so I really want to make a veg plot in the garden of our new house, as those are 2 things that would be hard to grow indoors as they take up too much space.